Shakhari Bazar is still the most popular venue for Hindu festivals. Since the collapse of a multi-storied building at Shakhari Bazar, the stream of criticism from the media and different segments of the society, as well as the government have never ceased to pour in. In fact over the last two years, Shakhari Bazar has regularly hogged the headlines of the print and electronic media, mostly for the wrong reasons. Whenever there is an issue of safety of buildings, the typical example given is Shakhari Bazar. It has been stereotyped as the ultimate example of congestion, blight, and dilapidated buildings. 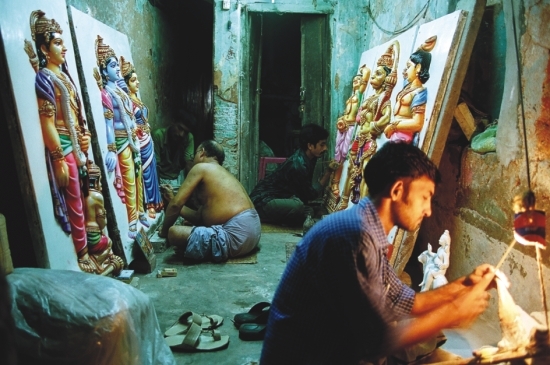 What has essentially been missed is the unique and exotic cultural heritage, which Shakhari Bazar as a custodian has nurtured and nourished for centuries. Shakhari Bazar, with its unique urban fabric, intricate artistry and craftsmanship, the ambience of a vibrant culture and traditions has an awe inspiring presence. It is our duty to protect, preserve and conserve such a treasure so that we can pass it on to future generations. With a little effort from the different stakeholders such as government, local government, host community, the public and private service providers and other civil societies, Shakhari Bazar can be turned into a safe, attractive site that will continue to be a tangible part of our heritage. 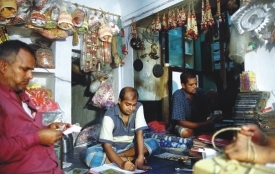 Shakhari Bazar is one of the oldest mohallas (a traditional neighbourhood) in Puran Dhaka (Old Dhaka). 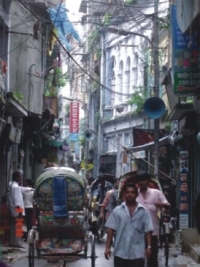 Located near the intersection of Islampur Road and Nawabpur Road the two main arteries of the old city and only a block away from the Buriganga River, Shakhari Bazar stretches along a narrow lane, lined with thin slices of richly decorated brick buildings, built during the late Mughal or Colonial period. Despite rampant modifications, accretion, extension over time, even redevelopment, many still bear the testimony of a rich tradition. The mohalla belongs to the Shakhari Community, who borrowed their name from Shakha, a richly decorated bangle crafted from slices of Shankha or conch-shells. Shakha is the symbol that indicates that a Hindu woman is married. Besides Vadya Shankha used as a trumpet, for mangal-dhoni (tune of good omen), other crafts include Jal-shankha for offering holy water to the deity and other decorative ornaments. Almost every use of Shakha has some sort of a religious connotation. Apart from Shakha a number of other traditional crafts are widely seen in the mohalla, to name a few are, musical instruments, paper crafts, Shola-pith or crafts using jute straw and Styrofoam sheet, Clay Statues for puja or other religious purpose, stone craft etc. In recent times there has been a remarkable rise in the goldsmith shops in Shakhari Bazar. 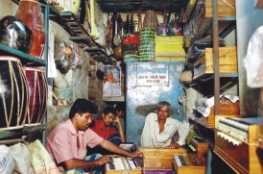 Shakhari Bazar is the manifestation of the irrational policies, lack of adequate development control rules and distorted legal framework, all of which have left their indelible mark on this precious little mohalla that shares a long history of more than 400 years with Dhaka city itself. Many temples dot this narrow street. Over the ages Shakhari Bazar has been elevated to the level of the most popular centre for religious festivities. As one of the most densely populated areas in the world Shakhari Bazar also has the largest concentration of the Hindus in Dhaka. At present there are about 10,000 people living in Shakhari Bazar and that within an area of 4.6 acres of land makes it one of the highest density areas of the world. Along with adjacent mohallas viz. Tanti Bazaar, Go-al Nagar, Jhulan Bari, Pannitola, it's also like a sanctuary to the Hindu community. The history of Shakhari Bazar goes back to the pre-Mughal days if not earlier. The first mention of Puran Dhaka can be found in the writings of Mirza Nathan, the general turned historian, who traveled with Subahdar Islam Khan. He mentioned Puran Dhaka, as the area between Dholai Khal and Buriganga river covering Shakhari Bazar, Tanti Bazar, Bangla Bazaar, Lakhsmi Bazaar, Bangla Bazaar, Kamar Nagar, Sutar Nagar, Goala Nagar, etc. Each mohalla belonged to separate communities depending on their craft and trade. The influences of the Mughal vocabulary in the planning of the spaces are literally evident in the use of Persian names to identify different spaces. 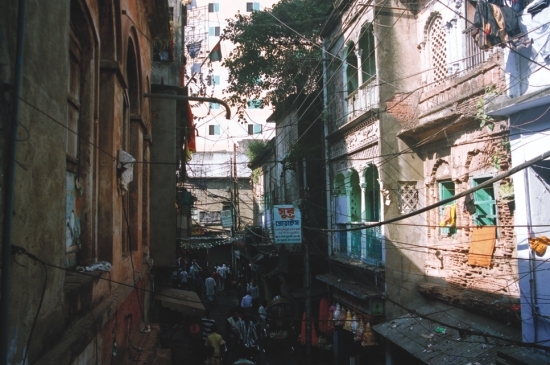 Shakhari Bazar has a distinct urban fabric. It is a 600 ft long narrow street lined by thin slices of brick buildings (150) 200-300 years old. These buildings are 10-12 ft in width and 70-100ft in length going up to 2-3 storeys. A few of the buildings were 4 stories in height. Each building with its richly decorated elevation in the Mughal or colonial style is characterised by a narrow long corridor and narrow winding staircases placed intermittently between rows of rooms. Each building has 2-3 courtyards. The staircase goes up to the open courtyard on the top floor, surrounded by a richly decorated verandah. A temple room opens into the courtyard. During the last 20 to 30 years a lot of demolition has been done for speculative redevelopment. About 40 percent of the old buildings have been demolished for new 6-7 storied buildings. The architecture of Shakhari Bazar is unique. A creative approach to the problem of congestion is evident especially in the way the courtyards have been built which are used not only for functional efficiency but as devices to incorporate the environmental factors like ventilation, light etc. Shakhari Bazaar displays a blend of different architectural styles belonging to different periods starting from the Mughals, to the Raj. Stylistic variations in Shakhari Bazar reveal at least three major stages based on chronologically identifiable features- the late Mughal , early colonial and the Raj. Though the Mughal and colonial style dominated the forms and the geometry of the buildings, motifs from Hindu legends and mythologies are widely found in the surface decorations and architectural details of the buildings. 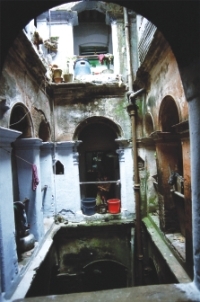 But there are certain architectural elements like the temple courtyards and the juxtaposition of the courts at different levels, which are unique to this mohalla. The division of elevation in three bays along with tri-foil, multi-cusp arches is a Mughal legacy. The short decorative free columns with bell shaped capitals, round pedestals and intricate surface decorations suggest a lineage that goes back to the architecture of Dewan-I-Khas. By the mid 19th century the architecture of Shakhari Bazar has taken a turn. The vocabulary was derived from the Mughal style but far less grand versions of the original ones. The graceful proportions were gone though the arches and the columns were retained. The religious following of the codes and orders were not to be found any more. By the late 19th century a stylistically distinct neo classical style could be seen in Shakhari Bazar. The architecture varied depending on the house type mentioned earlier. The architecture of this style reflected more of the classical elements in the decoration of the buildings. Use of classical orders in the columns, Pilasters, engaged columns, cornices, entablatures, stylised dentils all reflect a shift toward this new style. Among the different orders used, the preference for the Corinthian style is easily visible. Intricately decorated wrought iron columns, carved wooden posts, use of wrought iron railings are among other features that gives this period a distinctive style. In some of the houses the contemporary British influence can be seen in the Edwardian vocabulary used in the elevations. During this period Shakhari Bazar went through a wave of refurbishment in the front facade of the buildings. Roadside verandahs came in as a new architectural element, covering up the setback spaces or Ro-aaks at street levels. The social significance of Shakhari Bazar is equally important. Here we have a community that had remained totally insulated over the ages through intermarriages within the community, which is also known as the Shankha Vaniks. Even today the traditional institutions like panchayet remains the ultimate decision maker for the community. A distinctive social structure is based on the hierarchy of the Shakhari trade. The traditional pattern whereby the craftsmen, merchants and workers lived and worked in integrated communities are being rapidly replaced by a new pattern. The street is dotted with at least 20 temples along this short stretch of lane. On major religious festivals, for the Hindu community in the Dhaka City, Ramakrishna Mission and Dhakeshwari Mandir are the two major venues where the formal events take place. But it is Shakhari Bazar that enjoys the status of the most popular choice for the major festivals as well as the other festivals round the year. It is said that the din of the cymbals of puja never stops at Shakhari Bazar. For the residents of Shakhari Bazar festivities of different religious events are just their way of life. It is also like a sanctuary for the Hindu community. Its unique way of setting up a series of overhead stages covering the road adds a special dimension of the festivities. In a way, Shakhari Bazar epitomises the concept of urban blight. In fact over the last two years Shakhari Bazar has received more publicity for its infamous urban problems which are many. 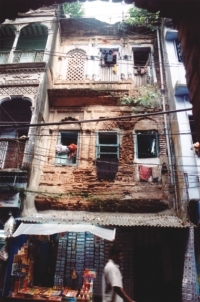 With the absence of adequate legislative framework for the protection of historic areas or area conservation per se and also lack of statutory financial support and a blanket lack of awareness compounded by the inadequate development control regulations and the lack of resources, the historic urban fabric of the mohalla is facing complete extinction. The shifting socio-economic aspiration of the people, allured by speculative redevelopment being fiercely promoted by informal developers has expedited the process of erosion of heritage assets and degeneration of the physical environment of the mohalla. Besides the heritage issues, the problems faced by Shakhari Bazar are mainly two-folded, environmental (physical) and socio-economic. These problems stem from the issue of the vested property and the discriminatory attitude of the city fathers towards this traditional community. Over the last half century, while being repeatedly subjected to dislocation and exodus, due to communal riots, legal harassment (promulgation of the enemy property act) and social discrimination, the community suffered irreparable damage, during the war of independence, in 1971. Ever since, very little has been done to redress the injuries inflicted upon this community over the decades; the riot of 1990 only exposed the vulnerability of the community. Living in a state of perennial dislocation, this community has huddled together, in a ghetto like space, seeking security in numbers and beau geste from successive governments over the decades. Absence of adequate development control rules, complicated by discriminatory land ownership laws compounded by illegal extensions and constructions has resulted in a very complex ownership pattern. Lack of maintenance and repair has resulted in a worn out appearance. Some of the buildings have actually gone beyond any repair due to lack of services and utilities and other urban amenities, multiple ownership of buildings, density of population and the aspirations of the residents. The steadily deteriorating state of the art of Shankha making and other traditional crafts has resulted in the diminishing incomes and impoverishment of the Shankha artists. Over the last 15 years the wage and the income of the Shankha shilpi has effectively, decreased, rendering the Shakharees poorer and economically marginalised. It is important, of course, that an urban environment is created while preserving the traditional urban fabric. This means alongside the conservation of heritage buildings, the people of Shakhari Bazar must have access to basic urban utilities, services and amenities including open spaces. At the same time the overall ambience of the exotic cultural and social fabric must be retained. It is effectively an urban regeneration project through heritage management. By identifying the stakeholders, from the private sector as well as the public sector, the service providers, along with the civil society as well as the community residents and their respective responsibilities we can figure out how to network between them and holistic approach can have a far greater impact. DCC needs to play a more responsible role on the issue; by collaborating with UNESCO and UNDP. With interventions in the built environment, we need to revitalise the other traditional crafts along with Shankha-shilpa and also the development of sustainable livelihoods for the artisans. To create new investment and employment opportunities as well as increased revenue generation development of cultural tourism needs to be targeted. At the root of the complex tenure ship pattern lies the issue of the Vested Property Act, complicated by multiple ownership from inheritance and also endless legal conflicts of ownership due to irregularities. Any effort to solve the problems of Shakhari Bazar need to solve this problem first. Then there will be other issues regarding building by-laws, covenanting for conservation etc. For a successful outcome of the project economic interventions are required for businesses, crafts, housing, and in the form of financial incentives for conservation as exemption of municipal taxes, income tax rebate soft loan etc. Financial support shall be required to compensate for the maintenance cost of the listed buildings. The financial supports for businesses need to have a bias for the existing and traditional crafts and businesses. To encourage leveraged investment from the private sector, public sector investments need to be very carefully planned. By careful planning, cultural tourism can be employed as a means of generating the much-needed revenue, which ultimately can play a very significant role in the creation of new investment opportunities as well as new employment opportunities. By strictly following the lines prescribed by UNESCO and WTO (World tourism organization) as laid down in the charter of ICOMOS. It is possible for the host community to reap the benefit of the tourist dollar. At present, approximately 2000-3000 tourist, that with out any promotional measure, visits the area every year; by careful planning this number can be raised to about 10000. That number can make substantial effect on the economy of the area. The creation of a thematic tourist circulation route is required to achieve this, besides other necessary amenities and facilities. For a Sustainable Conservation Plan, we should remember that we are dealing with real people and a real community; any conservation measure must take into account, their economic / financial capability/ affordability to participate in the maintenance of the restored buildings. It is important to remember that these people have been been living in these buildings and continue to do so in future, accordingly provision for the maintenance for the regular upkeep of the buildings and repairing of damages if any in future, should be taken into account. (Urban Study Group) is a voluntary organisation, involved in action research. It was formed by a group of architects spearheaded by the authors. 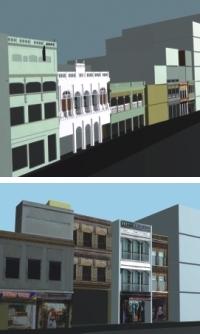 USG launched a campaign, under the auspices of the IAB (Institute of Architects, Bangladesh) for the conservation of Shakhari Bazar after the collapse of the building on 9th July 2004. From time to time quite a number of students from the Planning Dept. and Architecture Dept. from both public and private universities participated voluntarily. The photographs are courtesy from USG; photographers are Joybrata Sarker, Ar. Urmee Chowdhury, and Ar. M.Z.I. Razzaque. The massive migrations that took place in the aftermath of the India Pakistan partitioning in 1947, as a result of the bloodshed of the riots which affected almost all the major cities in India especially in Bengal; Dhaka was no exception. The dominant majority exerted force and the minority complied by leaving. Among others, Shakhari Bazar literally became abandoned except for a few families. By early 50's with the ensuing efforts by respective governments to pacify the situation and socio-economic hardship and difficulty in the new country, forced most of the Shakharees to come back to their home leaving behind plots which they received under the ongoing rehabilitation schemes by the Indian governments. In many cases the families partially repatriated. This had a far-reaching effect on the property. Series of acts / ordinances were promulgated and systematically the state took over the custodianship till the tyrannical law was passed. Following the Indo- Pak War in 1965, the government of Pakistan promulgated the infamous 'Enemy Property Act'. This essentially meant the confiscation of the Hindu properties by the government on the pretext of the unavailability of the real landowners of those properties. In many cases sons were denied the ownership of properties because the father had migrated and had died in India or chose not to come back at all. This Act practically ignores the Hindu Inheritance Law. Hindu law actually allows inheritance right to second-string relatives. 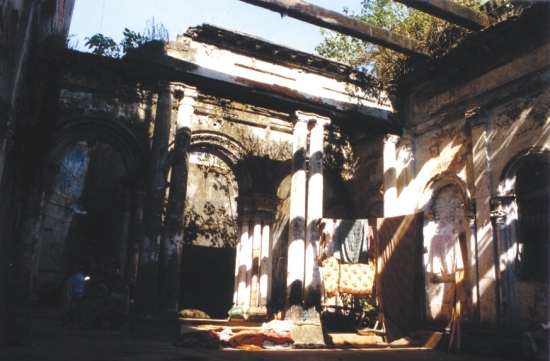 During the War of Independence the devastation of Shakhari Bazar is a well-documented fact. The wrath with which the Pakistanis attacked SB can be realised by the naming of the lane after Tikka Khan the Butcher of Baluchistan. Literally, every house had been vandalised; every family had lost at least one member. Unfortunately with the end of the independence war the much sought for revoking of the Act never came. The Enemy Property Act was simply given a new naming "the vested property act" retaining all its previous legal attributes and implications. Within three months after independence a new list of properties were produced. New names were added to the erstwhile Enemy Property list. We have once again shown the might of the majority. Over the last 35 years many more ordinances and acts have resulted in a total appropriation of the ownership of these properties. 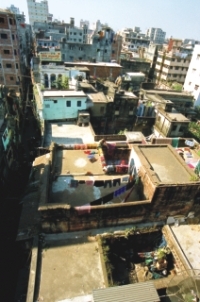 Prompted by the collapse of a 5 storied building in Shakhari Bazar on June 09, 2004, which resulted in the death of 19 people, the government swung into action, commissioned a technical committee with members from DCC, RAJUK and PWD, to make a list of vulnerable buildings of the city. The committee duly obliged completing the vulnerability assessment within a period of one month and in Puran Dhaka alone about 800 buildings were identified as vulnerable. The publishing of the list, which includes about 90 buildings in Shakhari Bazaar was followed by issuing of official notices urging/ instructing the owners or lessees to dismantle the buildings. Hanging on to the same list the DCC and other concerned government departments continued to heckle the owners /lessees in a periodical manner. Some even managed to buy a period of brief respite, by actually going for some surface repairs and replastering. It is learnt that to complete this task the RVS (rapid visual screening) was adopted. RVS method has been developed and used by FEMA (Federal Emergency Management Agency) of United States. As a methodology we do not question the effectiveness of RVS method, but we question the inferences that are being taken from its findings. Especially when such inferences have such far-reaching impact on our urban as well as cultural life. In fact, the RVS manual also recommends that a political decision is required to decide the kind of measures to be followed. In other words even the scoring system does not suggest demolition of the building as an eventuality. 1. RVS is largely a non structural survey, in the introduction of handbook on RVS it is a mentioned as "a sidewalk survey." 2. The scoring system of RVS only gives a cut off mark, the building's scoring higher than the cutoff mark can be considered largely safe, while buildings scoring below are recommended for Detailed Structural Assessment depending on the kind of use and number of users; in fact it is also suggested that the decision has to be a political one. 3. Lime Masonry buildings which are included within the URM (Un-Reinforced Masonry) are severely handicapped and are bound to fall below the cutoff mark. 4. The vast wealth of knowledge that has been developed on Lime Masonry buildings has been totally disregarded. 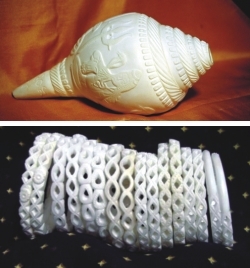 Prior to the partition of India and Pakistan in 1947, the Shakharees used to get the raw material for their craft, the conch shell or the shankha, directly from Calcutta, through their agents, where the shells were imported from South India and Sri Lanka. After 1947, import from Calcutta, stopped altogether and only direct import from Sri Lanka began. They had to buy from Dhaka agents from other parts of Bangladesh and collect the raw material for their mahajans. The mass exodus of the Hindu community, to India, as the result of riots following the partition in 1947, left Shakhari Bazar completely deserted. It was only through pacts at national levels that things started simmering down when repatriation took place. This was followed by some extra effort by the government to bring back some semblance of order in the area. Apparently, by 1953, at the behest of the government, reorganisation took place in the trade. Two organisations started operating. The two companies between themselves shared all the members of the Shakharee community and few of the members belonged to the Shakhari communities outside Dhaka. Under the new arrangement all of the raw materials were imported under the auspices of these two companies. As every single member of the community was a shareholder of either of the two, in effect, some sort of an ownership right over the craft itself was established. This didn't necessarily ensure most equitable distribution of profit .Apparently this arrangement worked quiet effectively and continued till the independence of Bangladesh, in 1971. After scraping through the crunch period of the post independence economy, the community was about to experience a turnaround of their lot. They were struck by a mighty blow under the belt. In 1975, with the introduction of the Wage Earners Scheme, the previous regime was almost rendered ineffective by allowing the individual mahajans to import the conch shell directly. This actually, sounded the death bell for the two organisations. However till the 90's, those two community-based organisations managed to sustain but with the move into the free market system they became redundant. All the imports are actually controlled by a few mahajans. In fact, at present a few mahajans are in total control of the whole trade now. Allegedly, the lot of the common Shakharee was never worse. They feel marginalised, exploited and dehumanised. Devoid of self-esteem, hope and empathy from the leaders of the society this community is only counting its days before taking the last gasp of air. Something needs to be done and that, right now. There are about 150 families from the Shankharee or Shankha Vaniks involved in the Shankha shilpa craft. Other than the Shankharees, there are another 150 families involved in other traditional crafts e.g. musical instruments, Shola-pith, the craft of making decorative artifacts from paper and jutestick and styrofoam and clay statues for religious purposes. Almost an equal no. of people have in recent times moved away to other occupations. Most of them have shown a lot of interests to come back if propper incentives are provided. Due to very high tariff and import duties and heavy tax on the import of raw mateterial for Shakha, the Shankha which is imported from Sri Lanka, Shakha Shilpa is facing an unequal challenge from the Indian shakha that is smuggled into the country. By definition area conservation is intended to protect ensembles, or group of buildings and the more modest buildings that contribute positively to the character of a place with their cultural significance. Cultural significance means aesthetic, historic, scientific, social or spiritual value for past, present or future generations. Cultural significance is embodied in the place itself, its fabric, setting, use, associations, meanings, records, related places and related objects. All buildings should be categorised depending on the degree of stabilisation and modifications required for making them functional under present requirements. A- Type: No modification should be allowed other than retrofitting and restorations. B-Type Upgrading the housing units to be allowed by the addition of toilets and kitchens. C- Type Complete internal modifications should be allowed keeping the elevation intact. 1. Retrofitting or consolidation of structures. 2. Restoration of the historic elevations and other architectural elements. 3. Reconstruction of part of elevations in significant buildings. 4. Upgrading by providing necessary modern utilities and services. 5. Renovation, targeted renovations will be required to bring back the spatial and environmental qualities. 6. Adaptation by shifting to different functional uses relevant to the area, when the building cannot accommodate the present use properly. There are internationally accepted norms of taking up a heritage management programme, which are considered self-binding with statutory protection. In case of Shakhari Bazar, we need to fast track the process and certain steps should be done immediately and given maximum priority. 2. All construction work should be suspended for a period of 6months. 3. A Task Force should be formed including architects, engineers, planners, and conservation experts, urban historians, social scientists and NGOs. 5. Listing of buildings in Shakhari Bazar in at least two categories; some of the buildings would make it to the national list while most of the others need to be listed for the importance to protect the urban fabric. 6. Documentation of the existing buildings should be completed. 7. Development of a Strategic Plan for a comprehensive development of the mohalla.